New Season of 24 Starts January 17th! The next season of 24 starts January 17th! Get ready! 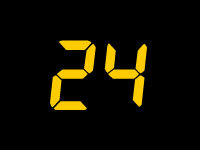 The new season of 24 starts in January! Thanks to John and Andy! Previously on 24: Dubaku started to rethink his subscription to the dating site “eTerrorist”; Chloe thought the FBI had been sabotaged when she found out someone had installed Vista on all their computers, and she was right; Olivia, the presidential daughter, went running back to her mother and father when she realized that if they died, her lobbyist career would take a real hit; Jack and Renee convinced Marika that acting as a decoy for Dubaku could in no way end up badly; Janis started messing with computers when Chloe was in the room, trying to save her phony baloney job, not realizing she just took her life into her own hands; Agent Aaron showed up, quite possibly because a certain ex-First Lady is driving him nuts; Sean was revealed as The Mole, and thought he was kicking off another great season at ABC, but unfortunately for him this is FOX, where Jack does all the kicking. 5:00 pm – Sean’s girlfriend Erika brings evidence of the warrant that stopped Jack at the police barricade last hour, and it turns out she’s in on Sean’s Evil Plot too. Sean tells her that he bugged the phone that Larry is using, and she flips her lid until she realizes he’s talking about surveillance equipment, not roaches. 5:01 pm – Jack and Renee continue to argue with the police that they really are the good guys and are chasing down terrorists. Unfortunately, this is the exact same excuse that hundreds of motorists in the DC area use every day, and the police aren’t buying it. After they get thrown in the police car, Renee points out that Marika is going to have a tough time dealing with Dubaku without Jack. 5:05 pm – Marika meets Dubaku, who gets really upset that she’s got a Palm Pre when he doesn’t. He tries to tell her that he’s completely misunderstood, and that he’s only a part-time psycho-killer from a fictional country. Marika realizes this all might be a silly mistake, goes along with Dubaku, and leaves with him in a car. 5:06 pm – The police release Jack and Renee, after getting word that Jack and Renee shouldn’t have been arrested in the first place. Renee is so excited that she asks for Sting’s autograph. Jack has to pull her aside to tell her that these police aren’t the police she’s thinking of. She takes a phone call from Agent Larry who says he feels like a goofball, because Marika’s phone went dead about 3 minutes ago. Renee says that’s probably because it’s a first generation iPhone with one of those lousy batteries. 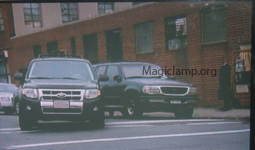 Chloe gets onto her computers and they find Dubaku’s car via one of the traffic camera websites she subscribes to. After announcing they found the car, and fulfilling their product placement obligations with Jeep, they tell Jack where the car is heading. 5:07 pm – Marika looks remarkably calm for someone driving around with guy who likes blowing up planes. Dubaku continues to sweet talk her saying that he really wants to spend time with people he cares about, and with children who have machine guns, because he feels a lot more at ease in those sorts of situations. Marika does look a little worried still. 5:08 pm – Jack and Renee follow Dubaku’s car long enough and in enough traffic that jack finally snaps. He goes four wheeling in a downtown park. There’s a brief car chase until a traffic accident stops Jack’s car, which baffles Jack so much that he tells Renee to get on to of the car to see if that helps. Marika finally realizes that things aren’t going to according to plan, and shows the driver the palm of her hand, in a very up close and personal way. This completely baffles the driver. He turns the wheel for a better look, and accidentally has an accident. The car flips several times. Jack gets so excited by this, that he runs towards the Jeep and shoots the driver to celebrate. Jack grabs Dubaku. The car’s on fire and Renee goes after Marika to save her… They argue briefly about the role of minor characters on “24” until Renee convinces Jack to help get Marika out of the car before it explodes. They get her out of the car just in time for the car to do its impression of a Pinto wagon, and they’re thrown to the ground. Jack and Renee are hurt, but Marika doesn’t feel a thing, because she’s already dead. 5:16 pm – At the hospital, Ethan talks about various things that are going on around the world, while Mrs. President has a staring contest with a wall. She blames herself for what happened to Henry, since she didn’t believe what he was saying all this time about their son’s murder. She says she’ll have to rethink all those times he told her about the Illuminati. Bill comes into the room to inform them that Dubaku has been captured, his subplot is ending. Bill also says the bigger subplot about the government conspiracy in her administration is going to be harder to figure out without Dubaku. Bill wants her to go someplace safer, telling the president she shouldn’t expose herself. Ethan starts to say that he wouldn’t mind seeing that, but is interrupted when Mrs. President tells Bill that she might expose herself even more at the White House. She finally agrees to leave the hospital, because Henry’s subplot isn’t due to go critical for a while longer. 5:18 pm – Back out at the accident scene, people are busy covering up bodies with yellow plastic wrap in the latest Cristo performance art piece. Jack yells at a couple of paramedics to wake up Dubaku, because he thinks Dubaku is faking a coma. They inject the drugs into Dubaku, who finally wakes up. Jack threatens Dubaku’s family unless he talks. Dubaku tells Jack that he has a “list”, that he checked it twice, and it turns out everyone on that list is naughty. Then he passes out, going into cardiac arrest. The paramedics zap Dubaku a couple of times, bringing him back, while finding a metal plate in his chest. Jack takes great interest in the plate, and he gets the paramedics to open Dubaku’s chest up. They find an electronic storage device that Dubaku kept under his skin. This kept it safe, but made it extra hard to explain to airport security, and really inconvenient to read with a computer. Jack gives the device to an Agent who is going to bring it to Larry. Jack gives strict instructions that only Larry should get that device. 5:23 pm – Sean hears this, panics and runs into the woman’s bathroom. He’s able to cover up for this by taking advantage of the fact that Erika happens to be in there washing her hands. Sean tells her that Jack found Dubaku’s database, and things aren’t completely under control. Erika completely freaks out, saying that she really doesn’t want to go to prison, because it’s “icky”. Sean tells her that all he has to do is install Windows 95 on all the computers when Chloe tries to read the Dubaku database, and that should keep anyone from reading it. Erika suggests they tie the main servers together. Sean tells her that it would be a lot easier if they logged into the computers to destroy them, and she agrees. They share an evil kiss, and leave the bathroom. 5:30 pm – Jack, Renee and Dubaku are that the hospital. Renee either got a wound on the neck, or is now self-conscience about a Larry hickey – either way, she has a bandage on her neck. Jack informs her that Chloe now has the device, and as soon as she cleans off the Dubaku gunk on it, she’ll be able to find out what’s on it. Renee takes this opportunity to point out that Marika is dead. Jack tries to explain that minor characters die on the show ALL THE TIME. Renee still isn’t used to this, and decides to give Jack a hard time about it. Jack completely ignores her taunting. 5:31 pm – Larry gives Chloe the storage device. She realizes that she doesn’t have any Norton Delete File Recovery tool on the system she’s on, since it’s a Macintosh. If the drive gets erased somehow, it’s going to be impossible to read through the inodes in the file system to recover it because they’re not using a journaling file system. Larry is baffled by this, but says “OK” anyway. Chloe starts the download of the data. Meanwhile, Erika is in the server room plugging in a lot of cables that have nothing to do with the task at hand. Sean comes in and watches some of the security cameras that are all over the facility (EXCEPT in the server room) to make sure that Larry and Chloe don’t sneak up on them. Sean gets a call on his cell phone. He tells Burnett that Dubaku has been captured, the FBI has the database, and that everything will be OK, despite appearances. Sean says he’ll take care of erasing the database, and all Evil Travel Agent has to do is kill Dubaku. Sean hangs up after hearing Erika freak out about why the computer isn’t formatting. She solves this by “configuring parameters”, causing the screen to go green, which is the universal indication that the drives are being reformatted. Chloe realizes this, and she and Larry go running off to the server room. Sean takes this opportunity to shoot Erika in the stomach, and himself in the arm and he slides the gun over to Erika. Since Sean doesn’t do this every day, he doesn’t realize it’s going to be a little tough to explain how both he and Erika got shot when there’s only one gun, and Erika seems to be the one that had it. Larry asks what’s going on, besides the obvious dead Erika on the floor. Sean tells him that “The Dead Erikas” would be a good name for a rock band, and then starts speaking in fancy computer jargon, which baffles Larry. Chloe doesn’t look as convinced. She is convinced that the computer has been completely reformatted, taking all of Dubaku’s files with it. 5:40 pm – Sean and Larry are in the FBI infirmary where Larry tells Sean all the things that Jack told Larry not to tell anyone. Larry feels this is safe because there’s no way that what happened in the server room looks at all suspicious. Larry gets a phone call from Chloe who tells him that she was able to recover all the files because she was running a very recent version of SVN, and everything has been saved. The files were being decrypted all during the last commercial break, and she has everything. She continues to work on this while Larry waits. Larry takes this opportunity to tell Sean that everything is fine, since Chloe saved the files. Sean takes this opportunity to leave the room as fast as possible, since he knows his name is going to be on that list. 5:43 pm – Sean works his way out of the building, and is accosted by Janis one last time. He looks just like anyone else would in this situation, very happy to get away from Janis. He continues to try and leave the building, but is finally stopped by security. Larry slams him into the wall, briefly considers torturing him with Janis. Sean asks for a lawyer, and Larry backs down. Jack would never have backed down, but well Larry just has him hauled away to a holding cell. 5:45 pm – Marika’s sister, Rosa, finds Renee at the hospital, where Renee tells her “Marika didn’t make it. Marika is dead.” She says, “I don’t understand”. Renee explains what dead means, and hands Rosa Marika’s watch. This doesn’t go over as well as Renee hoped, because Rosa really doesn’t want that watch. Jack calls Renee over to let her know they have the names of everyone involved in the conspiracy, and that they’re going to have a giant arrest party soon. Renee tells him that she’s very upset about Marika. She asks Jack if he’s human, if he feels anything, asks if he feels anything. She slaps him a couple of times. She tries a third time, but Jack stops her, which is a good thing, because otherwise he would have had to shoot her. Jack leaves. 5:52 pm – Mrs. President walks into a room where Olivia is waiting and explains what happened with Henry. Olivia wants to go see her father, but Mrs. President grounds her, and doesn’t let her leave the White House. Olivia says something snotty, and the President leaves. 5:54 pm – Bill tells Mrs. President, “I have very good news”. She says, “You can save me money on my car insurance?”. Bill says, “No, but we did get a list of people involved in the Dubaku conspiracy.” Turns out there are over 100 people on the list, and they should be making arrests within the hour. Bill points out that Jack was instrumental to getting this list, and asks that Jack not have to testify at the congressional hearing. Mrs. President shows her gratitude by saying “I’ll think about it.”. 5:56 pm – Jack sits on some steps at the capital, enjoying the view when Tony comes by. Tony tells Jack there’s going to be another attack soon, and Dubaku’s boss, Juma, is behind this one and things are going to start happening at 7pm. Tony only knows it’s going to be “high volume, and high impact”. It seems that the same senator that has been giving Jack a hard time at the congressional hearing has someone on his staff that has been working with Juma! Boy, is he going to be surprised to find that out! Tony’s going to go after him. Tony tells Jack that he needs Jack’s help. 5:59 pm – Senator Mayer (also known as Senator Red Foreman) gets called to the White House, and questions that timing of the situation. Mayer wants Burnett to come with him to the White House. After the Senator leaves, Burnett gets a text message saying “Units in place. Operation on schedule.” Something tells me Burnett doesn’t want to be anywhere near the White House. Probably the look on Burnett’s face. Well, that and the previews. 6:00 pm – Time’s up! NEXT TIME ON “24”: JACK YELLS! ATTACKS AT THE WHITE HOUSE! TWO HOURS! LOTS OF BLOGGING! WAITING AROUND EVEN LONGER THAN USUAL FOR STEVE TO GET THE SUMMARY FINISHED! BE HERE IN A WEEK TO SEE WHAT HAPPENS! Previously on 24, we found out that: People STILL don’t know Jack’s reputation so he has them “ask around” about it; Dubaku disliked Henry’s finger so much he asked to have it removed; Dubaku is good at bamboozling American women; Larry likes meeting people at the Forrest Gump Reflecting Pool; When people walk on set while Jack Bauer is working, people get killed; Renee is great at scaring little children; Jack has no regard for shooting innocent beer; Henry’s dream of a circus career catching bullets has taken a very serious turn. The following takes place between 4:00pm and 5:00pm. 4:00pm – In some incredible driving, ambulances are already with Henry. Jack appears to be ready to operate on Henry when the drivers take their own lives in their hands by telling Jack to “get out of the way” which is usually code for “shoot me”. Jack lets them take over, so he can make a phone call to the Mrs. President. She is surprisingly unemotional about Henry getting shot, and lets Bill take over her security. He also manages to get Chloe a job as a “stay-at-home-mom-who-plays-with-computers-at-the-FBI”. Fortunately, she has that on her resume. 4:06 – Dubaku finds his girlfriend at work, and gives her an unbelievable story about the INS actually shipping him out of the country. He appears to be the first one they’re going to test this “shipping out of the country” thing on. He asks Marika to NOT tell her sister, since she’s the one that came up with the INS scheme in the first place. 4:08 – Dubaku calls an evil travel agent to arrange a flight out of the country. Dubaku wants to meet at the Roosevelt Continental hotel, presumably because it has a lobby with no lights in it, since he’s used to hanging out in those places. 4:10 – Renee makes one attempt to boot one of the Evil Dubaku laptops, but gets scared off when it says, “Abort/Retry/Kill”, so she tells Jack the computer won’t boot. Unfortunately for Jack, Chloe isn’t there. She’d be able to LOOK at the disk and tell him what’s on it. Since Chloe isn’t there, they start looking through the dead bodies to see if any of them know anything about booting computers. Just as Renee is about to call Geek Squad, Larry calls, which is pretty much the same thing. Larry tells Renee he’s heard from Bill, and knows what’s been going on. She brags about taking down six of Dubaku’s men and countless bottles of beer. Larry then takes the time to complain about Jack, and his tactics that got Renee scaring Mrs. Vosseler and her kid. Renee says she doesn’t like the fact that she had to scare the bejeebies out of Mrs. Vosseler, but the little kid really had it coming. Jack overhears part of the conversation, whispers “rookies”, and then interrupts the phone call to mention that he found a couple of PDAs, cross-referenced them by downloading the “iCrossReference’ app from the Apple store, and found some banking transactions registered to an address. They’re heading to the apartment in hopes there are some things to shoot. 4:16 pm – Marika arrives at her apartment, where her sister has fallen asleep from, coincidently, “24”. She goes to pack. 4:17 pm – Morris, Chloe and their CHILD participate briefly in a XM Genesis product placement. Chloe says she’s going in to work on the computers. She tells Morris to watch their son “Prescott” because with a name like that he’s already getting beaten up by other four year olds, and she doesn’t want to take any chances. 4:18 – Janis argues with Larry after realizing that getting through all the levels in Spider Solitaire might just be busy work he has her doing. Chloe arrives, and immediately gives Janis the evil eye. We’ve all missed Chloe. In a separate room, Chloe gets to use Macintoshes, the universal “good guy” computer. She’s a little worried that people might figure out what she’s doing. Larry tells her not to worry, and explains how the computers are set up. Chloe tells him that whoever set things up doesn’t know a breakpoint from a hole in the ground, and it turns out LARRY has been dinking around with the computers in his spare time. 4:19 – Larry starts to try and get in some digs on Jack, and Chloe will have none of it – She points out that Larry should spend a little more time figuring out his mole problem, and a little less time envying Jack so much. 4:20 – Moments later, after Larry assured Chloe that she would be able to work without anyone catching on that she’s there, Shaun’s in-office girlfriend tells Janis all about Chloe, and wonders out loud what she’s doing there. Janis moves an eyebrow, which is apparently her way of acting suspicious… or maybe constipated. 4:21 – Dubaku meets with Evil Travel Agent at the hotel and immediately spots all of Evil Travel Agent’s cohorts scattered around the lobby. Dubaku says if anything bad happens, like an accident, an exploding plane, or an in-flight movie of “Home Alone 4: Not This Again”, he’s going to wire all the information he has to the Justice Department, and knowing them, they’ll be able to figure out what’s going on in a few months, so Evil Travel Agent could be in pretty big trouble. Dubaku leaves. Evil Travel Agent calls someone to let them know Dubaku has figured everything out, and to cancel the in-flight movie. They need to get Dubaku out of the country. 4:22 – Marika’s sister, Rosa, wakes up, and uses her powers of deduction to figure out that Marika’s suitcase means she’s leaving. Rosa tells her that “Samuel” isn’t to be trusted, Marika doesn’t believe him and goes to leave – Just as Jack kicks the door open! They ask for Dubaku, and neither Rosa or Marika know who Jack is talking about. Jack shows them the screensaver on his phone, and Rosa realizes Samuel is this “Dubaku” Jack is looking for. Marika doesn’t take this very well, and Rosa looks completely vindicated, but still pretty scared at the strange man yelling at them. 4:30 pm – Mrs. President arrives with a secret detail of guys dressed up in complete Army gear. She meets with a doctor who tells her all kinds of scary medical stuff he learned by watching House, and that Henry is in very serious condition. He then excuses himself, saying he has to wash his hands, which is doctor code for “I didn’t vote for you”. She sees Henry being rolled down the hallway to surgery, and tells Henry that he was right about their son all along. She then goes to watch the surgery through a window, because she’s a big fan of House too. She asks Bill to get her daughter Olivia, but to only use someone Bill trusts, and who hasn’t made a cameo yet this season. 4:35 pm – Back at Marika’s apartment, Renee goes through all her picture phone photos of Dubaku, and the one with Dubaku dressed up as an evil clown is the one that finally convinces her. She was going to meet Dubaku to leave the country, so Jack wants her to talk to him. She’s really freaked out about this, because Dubaku might be dressed up like that clown again. She takes the call, and lies to Dubaku that Rosa understands everything. Dubaku is sending a car with a driver to pick up Marika. She’s relieved to get off the phone, and Jack asks for a “favor”, of going to Dubaku so they can try and grab him. She agrees. Jack asks for her phone, installs some cool “iTrackYou” software, and they’re all set. Rosa doesn’t like this and hugs Marika through an entire phone call Jack makes to Chloe. Chloe tells him that she can set up the tracking, but Larry installed Windows 3.1 on all the rest of the computers in her office, so instead of a couple of seconds, it’s going to take her a couple of minutes. Meanwhile, Janis tries to break in to see what Chloe is trying to do. She again looks frustrated, or at least what passes for her acting frustrated. 4:44 pm – Presidential daughter Olivia turns out to be a lobbyist, but since they have a contract, she’s not really a lobbyist. The person picking up Olivia is….Secret Service Agent Aaron, the most trusted Secret Service Agent on 24! She gives him a hard time until he tells her that her father is in surgery, and that she’s acting like a spoiled brat. 4:46 pm – Janis asks Shaun for the “digital data key”, because she’s paranoid about Chloe. Shaun is hesitant about this until Janis tells him that she’ll show him “The Difference Between Cats and Dogs”, and he agrees, after calling her a naughty word. Chloe calls Jack and says they’re all set to go. 4:48 pm – They go to leave, and Rosa tells Renee to keep Marika safe. Renee starts to give Marika instructions to keep her safe, and Jack stops her. Jack says that’s the “sissy” way of covert operations. Renee says she’s not comfortable about letting Marika out there “naked”. Jack asks if she’s wearing X-Ray specs, because it sure looks to him like she’s wearing clothes. The car arrives, Marika gets in, and it drives off. Since Renee has an old piece of equipment from several months ago, Chloe says it’s too old to use and decides to talk Jack trough the whole surveillance. Janis goes into the computer room, gets access to the high score list for Bejeweled for the office computers, and finds out what Chloe is working on. 4:55 – Wort on Forehead Thug drives Marika, while Jack and Renee follow, while Janis watches – Janis does something and it breaks Chloe’s screen. It comes back, and Chloe nearly instantly realizes her terminal is being spied on. Larry is baffled about what might be happening. Suddenly, Jack’s car is surrounded by a lot of police cars, but not so many it would make an excellent car chase, so he lets them stop him. Larry gets on the phone and tells the police to let Jack go before he starts shooting people in the thigh. Chloe finds a warrant for Jack and Renee’s arrest, which says they’re armed, dangerous, and very, very covert. Larry argues some more with the police. Janis brings back her “data key” to Shawn and spills her guts about what she saw. Shawn seems slightly surprised about this, and Janis says she doesn’t like what’s happening. Shawn must be auditioning for a contestant spot on “The Mole”, because he calls Evil Travel Agent, and lets him know what’s happening. Shawn seems very upset that Dubaku is still alive, and is even more upset that his name is in an actual database! He’s going to be really freaked out when he finds out what they do with e-mail lists on the Internet. As much as we all hate Janis, it turns out she’s merely stupid, and not The Mole Of The Day So Far. 4:59 – Evil Travel Agent calls Dubaku and lets him know Marika is helping Jack. Dubaku looks really upset about this news, and says he’ll “take care of” Marika. NEXT TIME ON 24: DUBAKU PUSHES MARIKA! MARIKA SLAMS DUBAKU! A SUV FLIPS! DATA IS ERASED! JACK GETS SLAPPED TWICE, BUT NOT THREE TIMES! I don’t know what it is about computer stories, but they always fall flat with me. It’s probably because I know too much about computers to not overanalyze the tech involved. This episode of Fringe was another one of those. It’s a little freaky that the pop-up window said “What’s that Noise?”, isn’t it? That was the same book Olivia’s niece, Ella, was reading from last show. Was he watching Olivia before now? …. One more thing: Olivia sure looks a lot like a grown up Donna Pinciotti. Must be the hair. Previously on 24, we learned: Yellow vans are completely inconspicuous in large metropolitan areas; Agent Janis may in fact be Joy Turner disguised as Phyllis Rosensteen; All Federal agencies use the same ringtones on their landlines; seeing a secret service agent put on rubber gloves is never, EVER a good thing; Neuromuscular drugs make it really hard to act; Bad guys are extremely talkative about what they’re going to do when they think you have no chance of escaping; If someone ever fakes killing you, puts a big piece of Saran Wrap over you, and then returns to cover you with dirt, don’t count on Allen Funt to jump out of the bushes – you better hold your breath. 1:00 pm – Agent Larry FINALLY has a full office meeting. He wants to do synchronized satellite sweeps, because he’s always wanted to try that after seeing that event in the Olympics. Agent Janis starts to complain, and makes herself look foolish in front of everyone. Shaun listens to “The Wheels on the Bus Go Round and Round” on his headphones while Agent Larry tells everyone that Agent Renee has been abducted. Larry gets pretty upset when Shaun calls Renee an “ex-agent”, and Larry tells her that she’s not dead yet, she’s probably just pining for the fjords. 1:02 pm – A blue van drives into the abandoned construction site, and Bill and Chloe stop at the EXACT spot Renee was buried. She’s not breathing for two reasons: 1) You can’t breath when you’re buried under plastic and dirt, and 2) Lack of oxygen forced her to. Chloe pulls out the adrenaline syringe she always keeps in her purse, and they save Renee. They let her know that they’re with Jack, and that she lost her bid to get the world’s record for holding her breath. 1:03 pm – In the inconspicuous yellow UPS van, Matobo and his wife look worried. Emerson tells Jack and Tony that Nichols is on his way with the diamonds and Happy Meals for everyone. Now that everything is going well, Emerson does what bad guys traditionally do, which is give long speeches about things everyone in the audience is curious about. This week’s speech is “Why Tony Is Not Dead”. Turns out that Christopher Anderson, unknown to everyone, including Tony, himself, and the writer’s for “24”, didn’t really kill Tony. If he had, Tony would be trying to eat everyone’s brains like a Zombie. No, what happened was Anderson MISSED killing Tony, and only slowed down his heart. Then Emerson came and got Tony and saved him, and was planning on using Tony against Jack. They continue to talk about Tony like he’s not there, even though he’s sitting right there next to them! Tony finally speaks up and starts talking about how they’re like brothers, and just before everyone starts singing Kumbiya, the van gets to where it’s going – An abandoned air strip, another one of the many abandoned places in the greater Washington area. 1:09 – Emerson sees Tony and Jack whispering to each other as the van pulls into the air hanger. Emerson tells Tony to go help Litvak with the door. Emerson pulls off something astounding: He gets Jack’s gun away from him, and gets him into a headlock! This is just too much for Tony, who shoots Litvak out of complete surprise. 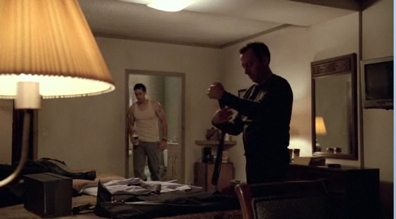 There’s a standoff between Emerson and Tony, while Emerson holds the gun on Jack. They tell each other to drop their guns a couple of times. When it’s clear that their “Rock, Paper, Scissors, Lizard, Spock” game is deadlocked on “Spock”, Tony finally just shoots Emerson. Emerson’s pretty surprised, so surprised he makes a big exaggerated movement to shoot Tony. By this time Jack gets a gun and shoots Emerson, who says, and I quote: “Gurgle”. 1:10 – Bill and Chloe tell Agent Renee that they’ve been running their own little conspiracy nut outfit, but it turns out that much to even their surprise, they might actually have a real conspiracy on their hands: Dubaku and Juma have infiltrated the government! Chloe works on Renee’s neck to stitch up the bullet wound that Jack gave her so it won’t look like a giant hickey and arouse suspicion. Renee wants to phone home to the FBI, but Bill tells her to get a Clue: He’s Sorry but she can’t call because it’ll put their Operation in Jeopardy, put Jack’s Life in danger, and other assorted board game references. Renee has to pretend to act dead, so she starts getting back under the plastic wrap, but they stop her and tell her she just can’t contact the FBI until they figure out how badly things have been infiltrated. 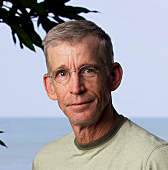 1:11 – Bill gets a call from Jack, who informs him of all the fun he’s been having shooting people. Bill tells Jack that he has to get Matobo to agree to their “plan”. Jack explains to Matobo that they have a “plan”, but doesn’t explain what it is. 1:12 – Meanwhile, back at the bad guy’s headquarters, no one has figured out how to turn on the lights yet. Dubaku tells Nichols to go get Matobo, and then get rid of everyone else. Nichols tries to convince him that Emerson’s team might be useful later, and that it’s considered “unfriendly” to shoot people in this country. Dubaku thinks it would be better to keep his diamonds, which he hasn’t shown anyone anyway. Dubaku then asks about the White House’s response to all of this, and can’t believe that after decades of a “Don’t negotiate with terrorists” policy, they haven’t changed their minds. Dubaku decides that Mrs. President will only respond to dead Americans, which is weird because most dead people have problems communicating, except to 10 year old boys. Dubaku decides to target planes in Washington, DC. 1:18 – At the Oval office, Mrs. President gets off the phone with Bob over at the NSA. She tells Ethan (who just walked into the room) she just realized that every single person that she’s ever spoken to over at the NSA is named Bob. In any event, another firewall is about to be breached, and no one has any idea where the off switch is on the thing, so things are looking grim and that Dubaku is behind it all. Her plan: To speak with all first responders across the country, which should take a minimum of the next six months. Ethan suggests giving Dubaku a gesture. Mrs. President shows him one, and he was thinking more of something along the lines of pulling the troops back. Mrs. President doesn’t go along with it. 1:20 – Tony checks on Emerson, and tells him he’s “sorry” for the whole shooting thing. He tells Tony to “Go to Hell” and “Gurgle”. Over in a non-gurgle portion of the airplane hanger, Matobo has caught on to the fact that Jack wants to use Matobo as bait for Dubaku. Mrs. Matobo seems to want to go along with it for the good of Sangala. (She knows that Sangala is a fictional country, and has been making eyes at Jack, so it’s hard to tell what she’s up to). Jack goes to Tony to get him to come along. Tony looks pretty upset about Emerson, but decides to help Jack hide the bodies, because bodies out in the middle of the hanger just might give their positions away. 1:22 – Dubaku still hasn’t done anything with the lights. It looks like he’s standing on the bridge of a Klingon Bird of Prey while he gets flight information from one of his henchmen. Henchmen starts rerouting planes. 1:24 – Ethan tells Mrs. President that the NSA has NFI where the firewall breach will be, and expects Dubaku to attack ASAP, and they might all be SOL. Meanwhile, Agent Tim gets a call, and they want to forward a call from Dubaku so Mrs. President can talk to him. This phone technology is completely baffling to them, and they don’t realize they can trace the phones. Dubaku tells Mrs. President he’s disappointed, and that she should look out the window. She does and sees a really bad firework off in the distance – either that or the aftermath of a plane explosion. Unless his demands are met, 10,000 people will die. This upsets her greatly, and she can’t talk for several moments. When she finally speaks, she asks “Is the Cabinet still assembled?” Ethan says, “This is no time to ask about furniture! Oh! You mean… never mind!” She goes off to meet with them. 1:31 – Mrs. President is getting briefed by Tim giving what sounds like a very gruesome mathematical story problem. The answer: 271 people are dead in the air, and probably more on the ground from the debris. Tim says that a congressman and his wife were also killed on the plane. Everyone is shocked by this – a congressman was actually with his wife – but it’s true. Everyone, including Tim, thinks Mrs. President should withdraw the troops. Tim says they’re just not prepared to show that kind of special effects on the budget the program has, so to get around that, she should comply with Dubaku’s demands. She finally decides that there will be a chance that Matobo will be recovered, and not like a piece of furniture – they could get him back. She tells everyone that she won’t negotiate with people that give her ultimatums. Joe the Secretary of State gets really upset, starts yelling, and finally leaves after threatening her with the fact she might be impeached. She tells him that he can either sit down, or leave. He finally leaves. She looks at everyone else as if to say, “Didn’t I JUST get done saying I won’t negotiate with people that give me ultimatums?” She gives a nice little preachy speech. This is quite boring, because she doesn’t shoot anyone or scream or anything. She leaves the room and gets a Laura Roslin look on her face while she leans against a wall. 1:41 – Jack waves for the camera inside the approaching blue van as it arrives at the hanger, and runs inside, realizing they must have just started the show again. It’s Bill and Chloe! Jack tells Chloe to put a wire on Matobo as fast as she can, which sounds like a challenge to Chloe, so she runs off to do it. Renee gets out of the van and is still upset at Jack for that whole “shooting and burying alive” thing. Jack tells her that if he’d told her what was going on back at the FBI, it would have shortened the plot of the show by a couple of hours, and the show’s called “24”, not “22”. Now Chloe is putting on rubber gloves, which, as noted previously, is NOT a good sign. She tells him that she has a special dental transmitter. He asks if she’s an FBI dentist, and she says, “No, I’m a stay at home mom”. Mrs. Matobo is clearly impressed with the skills that American stay at home mom’s have. Chloe gets the transmitter put onto one of Matobo’s teeth. Bill tells Jack about the plane collision and goes off to check on Chloe. Renee comes over to Jack to pout some more. They go over the whole “Renee can’t believe the government has been infiltrated” and “Jack tells her, ‘well, it has'” yet again. 1:44 – At the White House, Tim pulls Ethan aside telling him that a lot of Americans are going to die of boredom soon, if something doesn’t happen on the show soon. Ethan says he knows someone that might be able to talk some “sense” into Mrs. President. 1:45 – That person is Henry, Mrs. President’s husband. Unfortunately, Henry can only give people dirty looks right now because of his neuromuscular relaxant. Downstairs, the guy who took Samantha back home sure took his old sweet time about it, because it took over 45 minutes to get her here! On “24”, that’s at least 90 trips around the entire metro-Washington area, if Jack were driving. Anyway, Agent Gedge is upstairs redecorating the place, pulling all kinds of wires, and generally acting in a way that he’s NOT going to be getting a good merit report from Henry at the end of the year. Samantha goes into her apartment and sees Henry sitting there. He tries to give her a warning grunt, but she doesn’t hear him. She tries to makes small talk with him, which you’d think he could do, but it doesn’t work. Agent Gedge comes up behind her and kills her. During the middle of Gedge’s attack, Ethan calls. Gedge gives Henry a “Isn’t that always the way?” look, and takes the call. Gedge tells Ethan that Henry is meeting with Samantha right now, and he has NO idea what’s going on up there. Ethan tells Gedge to get Henry to call him as soon as he can, and hangs up. Henry looks like he would LOVE to do that, because it’s a lot better than watching Gedge be a psychopathic killer. Gedge puts the knife into Henry’s hand to get fingerprints. Henry realizes that the neuromuscular relaxant is wearing off, and starts remembering as much of the Karate Kid movie as he can. 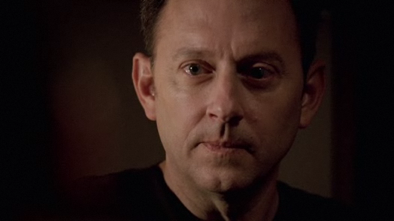 1:54 – Nichols’ SUV gets to the hanger, and he is surprised to find out that Tony is there alone! Tony tells him that he didn’t like the time he spent with the FBI, so he killed everybody he was with. Nichols wants to see Matobo and his wife, and Tony insists on seeing the diamonds first, and he’s not talking about almonds. Tony must have taken a jewelry correspondence course while he was away, because he looks at the diamonds and is satisfied. The thugs check in the yellow van, and viola! Two Matobos! Nichols tells Tony that they might need him again, and then a split second later changes his mind. Fortunately for Tony, Nichols is pretty new at this, and nods his head at someone BEHIND Tony, which Tony clearly sees. But before Tony can do anything, Jack and Bill shoot darn near everyone, except one Thug and Nichols. Tony tells Nichols to forget the whole “you almost killed me” thing, and tells him to take the Matobos, which he promptly does. Nichols and company leave in the SUV. 1:57 – Gedge drags Henry to chair near a balcony for a more gruesome view of what’s about to happen. Gedge hangs a rope over a beam to hang Henry, while Henry balls his fists up. Gedge ignores him, which is a real shame for Gedge because Henry has just enough strength to choke him. They BOTH go over the balcony, and land on a table. Gedge is dead! Henry looks like he does NOT want to try that again. 1:59 – Dubaku is on the phone with Nichols, telling him that he thinks that Mrs. President is insane. Before Nichols can say, “it takes one to know one”, Dubaku hangs up on him. They target Kidron, Ohio for their next attack. Dubaku says, “Begin” just as the show ends. 2:00 pm – Time’s up! NEXT TIME ON 24: CHEMICAL PLANTS! ATMOSPHERIC RELEASE! MISSING HENRY! EXPLOSIVE DUBAKU HIDEOUT! SEE YOU NEXT WEEK! ABC has put all four seasons of LOST online for viewing…. Take a look! Dharma Announcement #4 and New pictures! One of the fun things about shooting the show in Hawaii is how completely inconsequential Mother Nature makes us feel. This week a landslide hit one of our upcoming locations, and now we can’t shoot there for a couple of weeks while the site is restored. In season two it rained for a truly Biblical 42 straight days and nights, which required lots of schedule revisions, and when that wasn’t possible our fearless crew put on their wading boots and shot for days on end in mud that was literally knee deep and higher. Speaking of mud, this week our exclusive video for you features OUR ANSWERS to YOUR QUESTIONS, which many of you sadly will find maddeningly obtuse and muddy. Other LOST fans, like our mothers for example, will find our answers sparking, insightful and maybe even amusing.